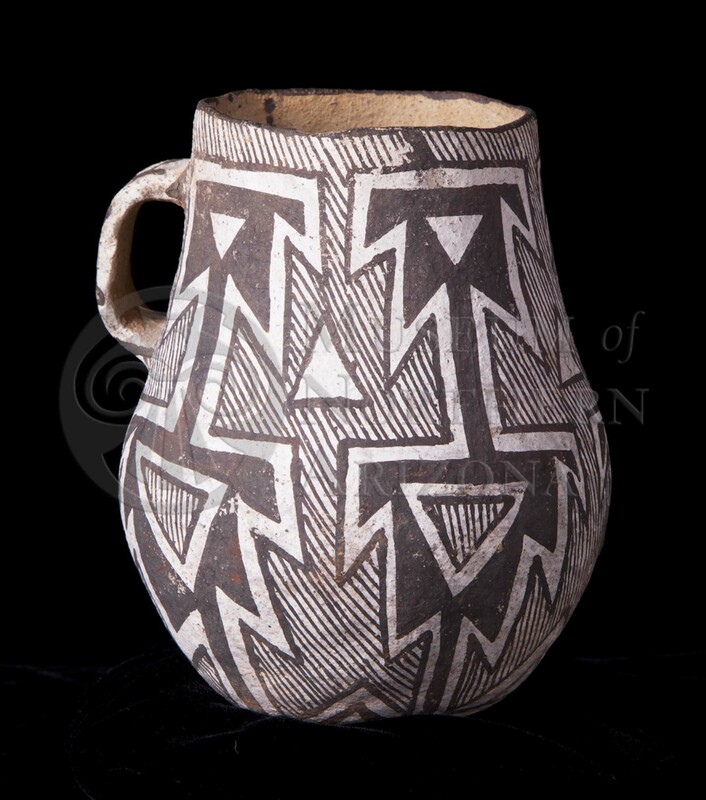 Puerco Black-on-white pitcher from the Museum of Northern Arizona collections. Click the image to open the Puerco Black-on-white gallery. Puerco Black-on-white is a type of Cibola White Ware characterized by bold solids separated by thin parallel lines. The jar pictured above is also interactive! Date Range: ca. A.D. 1050-1225. Firing: In a neutral to reducing atmosphere. Temper: Crushed sherds with sparse to heavy sand. Surface Finish: Smoothed, usually slipped, and often polished; slip can be thin or thick, and often streaky. Surface Color: White to light gray. Forms: Bowls, pitchers, ladles, effigies. Paint: Matte black to brown to reddish brown. Pigments: Mineral, occasionally mixed with some organics. Design: Banded, vertically sectioned designs separated by parallel vertical lines running perpendicular to the rim; negative elements, with some hatching; squares, checkerboards, parallelograms, triangles, negative lightning, and negative bullseyes are common; ticked bands sometimes present; checkerboard, cross hatching, and dot filled squares are common; solid triangles, rectangles, scrolls, and appended dots occur alone or combined with other elements. Comparisons: Red Mesa Black-on-white has small solid designs and no negative elements; Puerco Black-on-white is bolder, with more solids and negative elements, and generally lacks dots and ticks around the solids. Escavada Black-on-white has thicker solid lines, barbed solid lines and bold solid designs that are angular to one another; Puerco Black-on-white design elements tend to be parallel or at right angles to one another. Kintigh, Keith, Greg Schachner, and Josh Watts. (2003) El Morro Valley Prehistory Project Ceramic Guide, Arizona State University, Tempe. Zedeño, María Nieves. (1994) Sourcing Prehistoric Ceramics at Chodistaas Pueblo, Arizona: The Circulation of People and Pots in the Grasshopper Region. Anthropological Papers No. 58, University of Arizona Press, Tucson.